It’s complicated, but for Lauren Papp, relationships are an endless source of fascination. 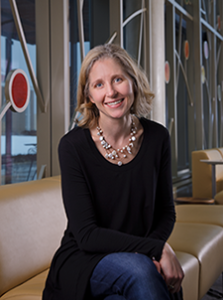 Papp, an associate professor in the Department of Human Development and Family Studies at the School of Human Ecology, has been at UW-Madison since 2006 and started the UW Couples Lab in 2007. Right now, Papp and her students are recruiting for two studies: a dating study for people ages 18 to 25 and an empty nest study for couples whose adult children have recently left home. Both are ongoing studies that Papp plans to wrap up by the end of the summer. More information can be found here. She works with 10 undergraduate students and three graduate students in the lab. Many are studying areas such as psychology, social work, nursing and human development. Amber Smits, a junior majoring in human development and family studies and psychology, has been a research assistant at the lab since fall. Last semester, she and other undergraduate students observed interviews with couples. This semester, they’ll get to do more hands-on work, including helping conduct interviews. Smits plans to go to graduate school and study social work. Papp, along with her students, has learned a thing or two from the Couples Lab – namely how important a good relationship is. Papp is married and has two young daughters. She says demonstrating a healthy relationship by working through conflicts is one of the most important things parents can teach children. Be an agreeable and engaged person most of the time; be kind, good-natured, and forgiving. These qualities go a long way in making you feel good, improving your partner’s daily experience, and keeping the relationship a positive place for both people in it. Minimize your negativity. Try to stay healthy and happy for your own sake as well as for your relationship. When conflicts arise, handle them directly and constructively. No need to bring up every other annoyance or dwell on past mistakes. Know that some issues will require more time and attention to resolve, and handle those discussions in the right time and space (for example, not when you’re hungry, or feeling rushed to meet a due date or deadline). Devote energy to keeping the emotional and physical affection in your relationship high. The time and effort you commit to developing and maintaining a satisfying romantic relationship can be a wonderful investment for ensuring your daily happiness and productivity as well as promoting health benefits for you and those around you for years to come. And for those not in a relationship but looking for a Valentine’s date, Papp says you should prioritize what’s important to you.